Juli | 2010 | FREE IRAN NOW! Und die Toten wackeln auf ihre Art an den historischen Fundamenten der Islamischen Republik Iran. Niemand entkommt seiner Vergangenheit. Und irgendwann, irgendwann werden sich die Massengräber auch hier öffnen. Nicht nur für Historiker spannend, enduring america über ein neues Kampffeld innerhalb des Establisments. I cannot help getting the feeling that officials are using nationally important information for their personal or factional gain, yet one effect of these disclosures is that they will further erode the Islamic Republic’s historical foundations. 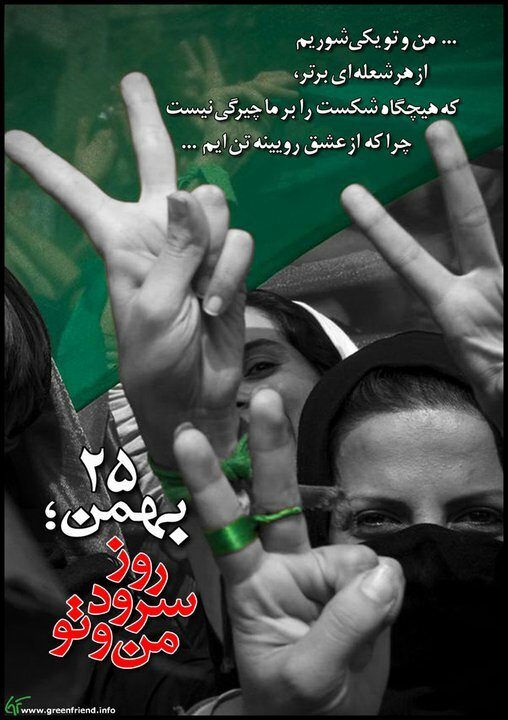 In this crisis, the regime’s important days being tarnished: Qods [Jerusalem] Day in became “not Gaza, Not Lebanon” day, 13 Aban [in November] was a day when the regime’s commemoration was so heavily guarded that it looked as if its marchers were prisoners, 16 Azar [National Students Day in December] became an occasion on which universities across the country voiced their protests, the funeral of a Grand Ayatollah Montazeri in the holy city of Qom turned into an anti-Khamenei demonstration, the religious celebration of Ashura [27 December] became a day on which the regime murdered its own citizens on the street, 22 Bahman [11 February] saw Iranian cities turned into military camps, and 14 Khordad [4 June] saw the humiliation by regime insiders of the grandson of Ayatollah Khomeini on the anniversary of his death. Now the carefully guarded regime-backed version of the Iran-Iraq War is being disputed by regime insiders. Next chapter to come soon? Selbst der Appeaser in Chief appelliert öffentlich an die „Islamische Republik“, die Gefangenen freizulassen – sie werden seinem höflich vorgetragenen Wunsch sicher entsprechen, die Herren Islamfaschisten. So the danger going forward is twofold: First, the listed companies will no doubt try to hand the baton to successor firms, as Iran has done in the past. The second is that Europe’s unity of purpose could crumble if the sanctions begin to have real effect and Iran responds by returning to the negotiating table—demanding, in return, that the sanctions be lifted. Europe, to say nothing of the Obama Administration, might be tempted by such an offer, but accepting it would undermine any previous progress. If negotiations have any hope of working, it will only be because Tehran concludes that the cost of becoming a nuclear power exceeds what it perceives to be the benefits. We’re skeptical that these latest sanctions will work against a regime that wants a bomb in order to become a dominant regional power, but at least the EU is finally doing more than going through the diplomatic motions. The commander of the Iranian Revolutionary Guards Corps (IRGC), Muhammad Jafari, has admitted for the first time that there are elements within the IRGC who supported the protest movement. Displaced cargoes from Iran are pressuring gasoline premiums in the Middle East, traders said yesterday. As tougher U.S. and EU sanctions have made it more difficult to supply gasoline to Iran, so far only three cargoes of gasoline have reached Iran in July, much less than the seasonal norm.To view the MEMRI Economic Blog, click here. Iranian President Mahmoud Ahmadinejad announced a new program to encourage population growth in Iran and to do away with a long-held family planning policy. He offered to set aside a special account for every newborn child to be used when the child reaches the age of 18.To view the Memri Economic Blog, click here.